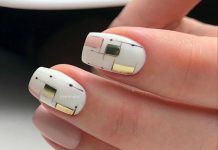 Hello NailDesigners! Nothing says fierce and beautiful like gold glitter nails. When we wear gold nail polish on our nails, don’t we feel just simply like a woman on top of the world? We feel confident and sparkling and gorgeous! Gold glitter nail polish is a must-have in our nail polish collection. 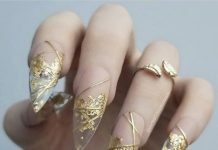 These gold glitter nail designs go with any outfit and it matches pretty much everything. You can mix and match them with any outfit, season, celebration, event, accessories, and style. 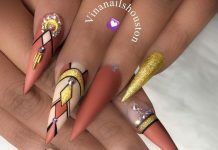 In addition, you can use gold glitter nail polish on its own, as an accent on top of another base color, or used in nail art designs like our favorite heart design in this collection. When you check out the designs we collected for you, pay attention to how each gold nail polish is different! Some have finer glitter. Some have bigger gold glitter. And some even have actual gold flakes. Imagine that!